Following swiftly from Part 1 is the pig sty. Pigs were an important asset from ancient times, as a valuable way of turning inedible things (cabbage stalks, acorns, beech mast and turnip tops) into edible matter (pork!). A place to keep the sow when she farrowed and somewhere for the pigs to shelter while they grow was essential. Although pigs were turned out into the woods at times to take advantage of the abundance of things like acorns, most of the time they would have needed to be confined, as pigs are inquisitive, industrious and frankly downright destructive animals, especially if they get into a vegetable patch! 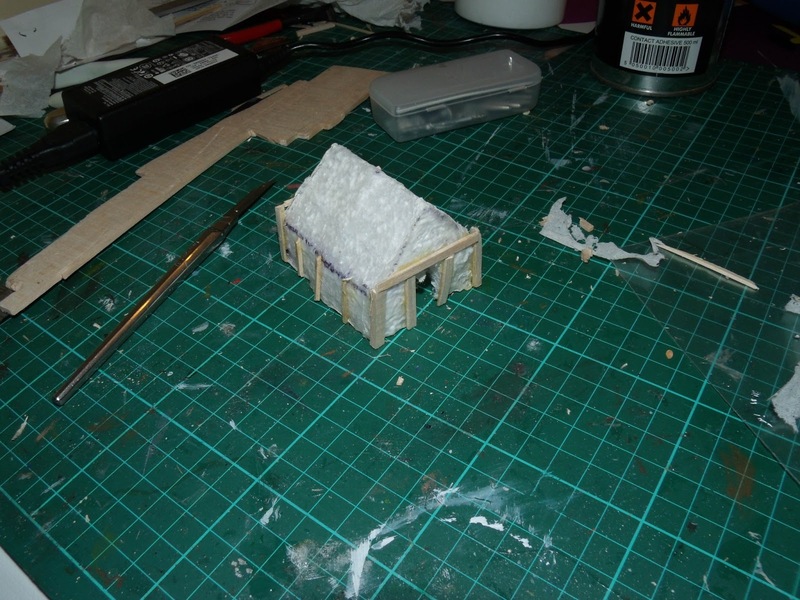 The pig sty follows the usual mode of construction: a simple block of foam, in this case 45x35x35mm is made into something shed-shaped, with vertical walls about 20mm high and a door cut into one end. 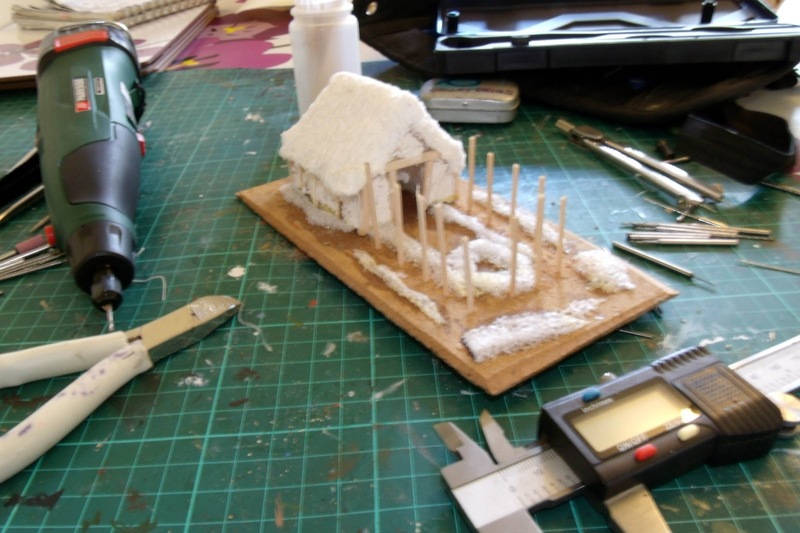 The pig sty could be wattle and daub construction, or planked, according to your preference. 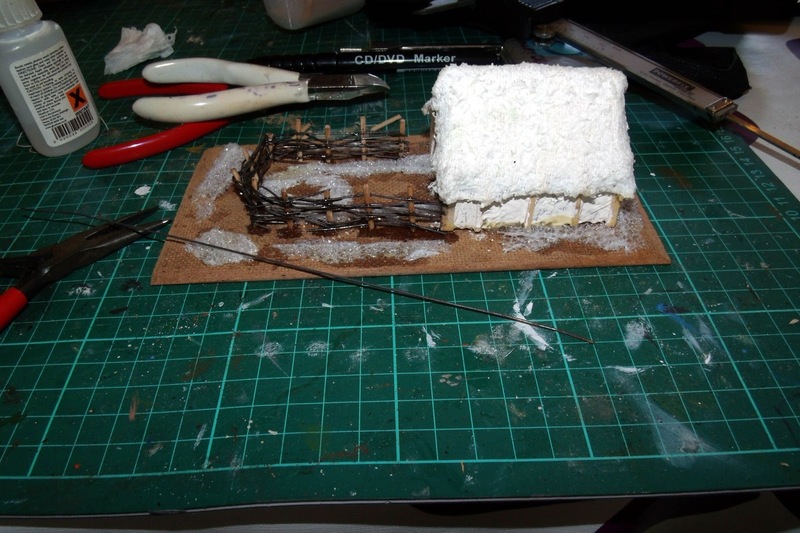 I've gone with wattle and daub, made with paper and PVA glue, and framing glued in place. 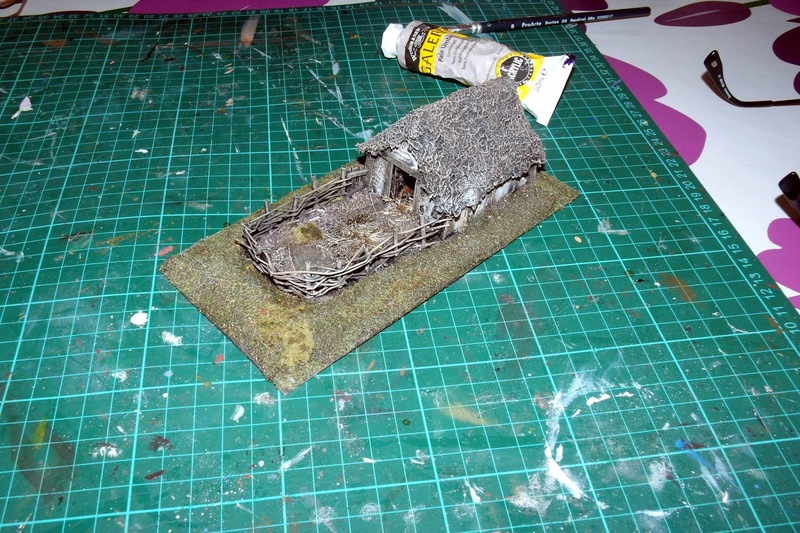 The roof is added with rafters and a towelling thatch. Pigs need plenty of ventilation to be healthy, and a lack of it will promote things like pneumonia, which will restrict the supply of bacon - and we wouldn't want that! The thatch and gaps under the eaves would supply this. 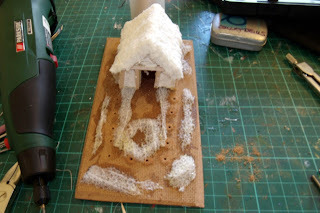 You've seen enough of how these buildings are made so I'll skip straight to the stage of having a completed shell. First, a row of holes gets drilled, at 15-20mm centres (so roughly 3-4 feet in scale) to take a row of posts. Postholes - always good for archaeology! Next, add the posts. These are cocktail sticks held in place with superglue, but thick wire would do. 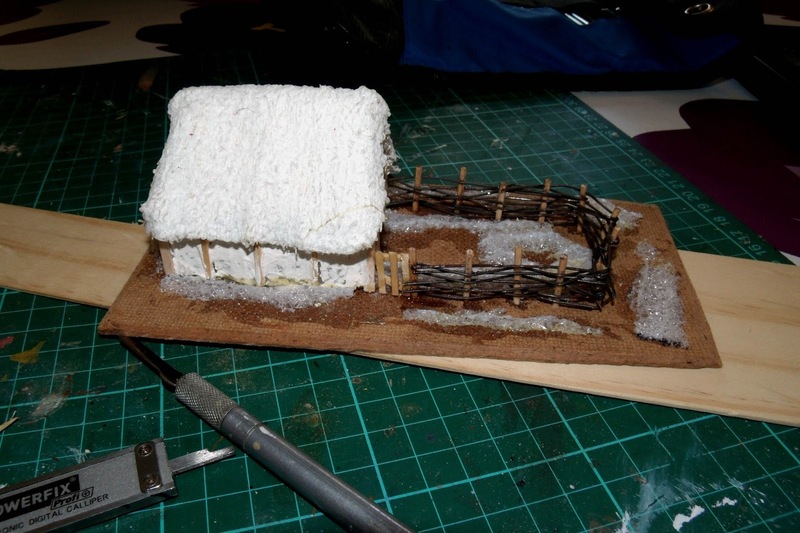 I aimed for 1-2mm diameter, so the posts would reflect using 2-4" timbers, which is about what might be used in the "real thing". Finally, the fence itself was woven in place. This is several feet of 0.7mm steel MIG welding wire, annealed with a blowtorch and cut into 40-60mm lengths. I was after the effect of thickish wooden poles interwoven. Copper wire or thin string would work. This was time consuming and fairly hard on my fingers, but I'm quite happy with how it looks. Once the weaving was completed I gave everything a good coat of thin cyanoacrylate to make sure it stayed in place. I deliberately avoided trying to use something that looked like a wicker hurdle. 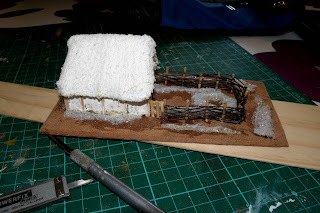 Any pig worth its salt would be through a fence build like that in no time flat! That ought to keep 'em in place! Finally, a gate, in the gap I left for that purpose. This is made pretty roughly out of basswood offcuts, then glued in place. Following primer, paint, flock, an ink wash and a thorough dry brushing with a variety of different shades, the usual coat of gloss poly went on to provide protection, followed by two coats of matt. Finally, I added a tuft of scrub, to represent a breakfast of turnip tops, and filled the hollow at the end of the pen with PVA to give the look of a nice muddy puddle to wallow in. I'll get some pigs at some point, but until then, I'll just say they're having a kip in the sty. Note that while the sty is partially hollow, there's no pretense of being able to put a mini in there. There's a reason for this. Nobody in their right senses would force their way into a small confined space occupied by a sow and her piglets. Even a man in armour equipped with a spear and a sword might think himself very lucky to come out without horrific injuries. 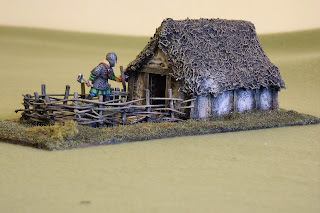 Here's an armoured Saxon from Black Tree Design for scale. He's either unusually brave or really doesn't understand how serious the situation is. Thank you! Praise from you is high praise indeed - glad you like it. Looks so great! 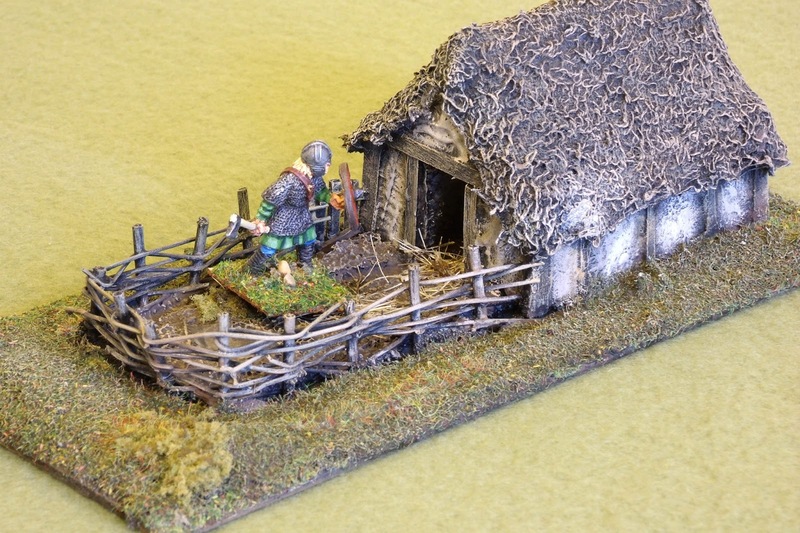 I especially love the fencing and thatch. Great job, and a brave saxon indeed!